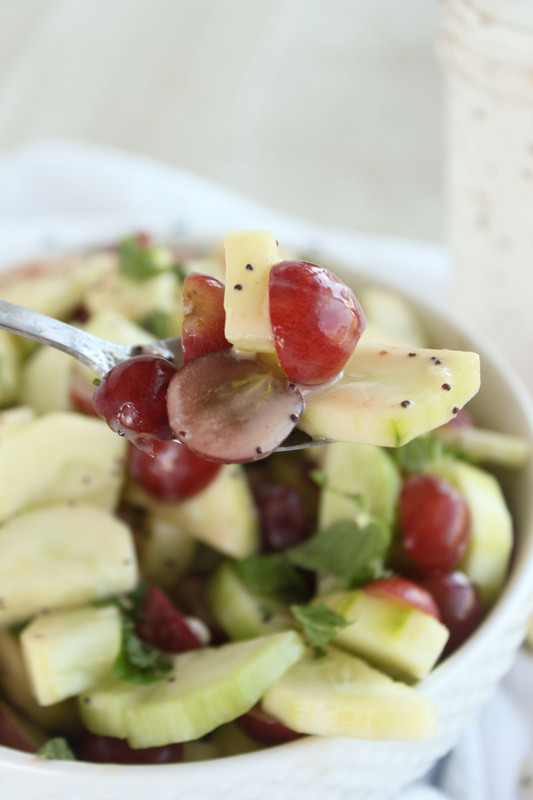 This ten minute cucumber grape salad with poppy seed dressing ->THAT DRESSING<- has been my staple lately. Partially because I’ve been overwhelmed with life but mostly because I’ve been overwhelmed with cucumbers. Apparently just like zucchini, they too grow like weeds this time of the year. I’ve pickled them with the fabulous homemade refrigerator overnight pickle recipe, floated them in water, made cucumber sandwiches, ate them plain and still there is one drawer in my refrigerator devoted strictly to these juicy, crisp and oh so cool cucumbers. I’m even contemplating making some edible face masks and giving my girls the spa treatment but then I look around my house and realize what my kids can do in a matter of minutes. So making edible, smearable, messy face masks makes me cringe a little bit. I’m sure it would feel a little bit like ripping a band-aid off. It burns only for a minute just for the wound to open back up and start bleeding again. That pretty much sums up the state of my house. Is it a problem when the puppy, the adorable, very naughty puppy (a.k.a. our janitor) doesn’t even want to do his job anymore. The poor thing, when you see him laying five feet from the table, which has more food than I would like to tell you under it and he is passed out on the floor with oatmeal crusted on his head you really start to think there is a problem with the entire picture. The puppy, the dog who eats near everything, all the time has surrendered to the chaos of meal time. He can’t even keep up and who’s to blame him. Maybe I should take a hint and just let it go, sit outside on the patio and sip some tea while reading a book. somedays trying to keep up just isn’t worth it. Either that or he is too bloated from the meal my one-year old was supposed to be eating but has learned it is way more fun to feed the dog than herself only later to wake up a million times at night because guess what, now she is hungry. Movies make parenthood look so pretty and easy… I’m going to assume that part is still to come? Please, don’t tell me it isn’t. Now that I feel better for venting I do have to say on a more nutritionally sound, professional level ->WINK<- that while easy to choose the wrong foods or eat out of comfort in stressful situations seems legit and like a very good excuse, trust me it isn’t. The reality is life is stressful, regardless. There isn’t ever going to be a perfect scenario, situation or day that goes perfectly as planned. And if it does, maybe those days call for celebration and not the stressful ones. Like any normal human, I too get the urge to bust open a bag of chips and sit pitying myself for how hard life can be. Buuuuuut, that gets me now where, instead I just vent to you about every other day and I feel better about life. Regardless, stressful, emotional eating will end up piling on the baggage instead of taking it off. It creates more problems, lasting problems which escalates the issues already going on. By having delicious, wholesome, nutritious foods at your fingertips that can suppress any urge to cave. 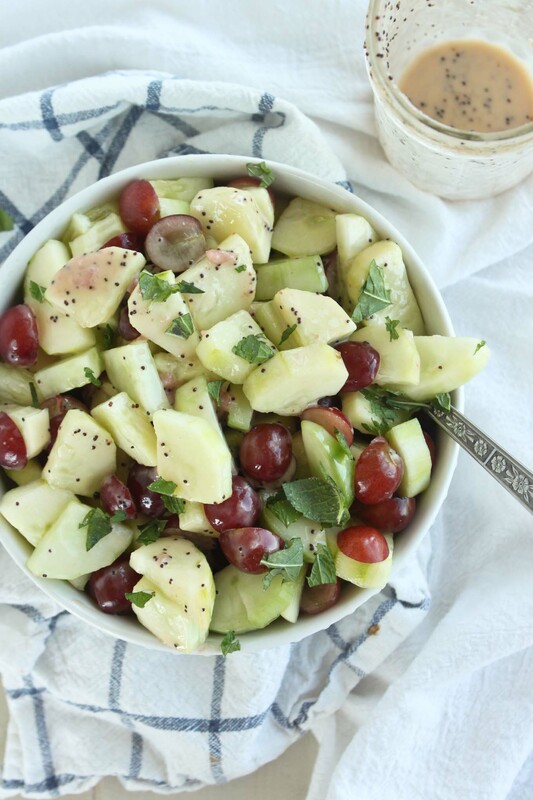 While this cucumber and grape salad may be cool, it is pretty darn comforting once you pour on that delicious poppy seed dressing. Fill your life with wholesome, nutritious foods so you always have something quick and easy to turn to when you get that urge. Unfortunately our food system has made bad food so disgustingly easy to get our hands on. We have to learn to beat the violent food chain that stands in our path and play the smart way. Similar to the theory of working smarter not harder. It doesn’t have to be intense, difficult or all time-consuming. It just needs to be present. Like if you want it you must have it. Stop buying convenience foods and junk foods, even for your family. Let them throw a stink and just give them the option that if they want it they can go buy it. See how that works. Unfortunately we’ve turned that scenario around. Because junk is at our fingertips and more often than not healthy food isn’t or it isn’t prepped and ready to eat when the urge comes we automatically roll to convenience. Stop buying junk and replace it with nutritious foods and more importantly prep and maybe even prepare these foods after you buy them so they turn into convenience foods. No longer do you have to peel the cucumber when you want to eat it, hey, hey, guess what? There is a bowl already peeled for you. Take the time and the thinking out of it, make it accessible, carry it with you, be well fed and you will notice those stressful cravings and urges diminish as you play the game smarter. Okay but in all seriousness small changes that overcome your weakness is a recipe for success. 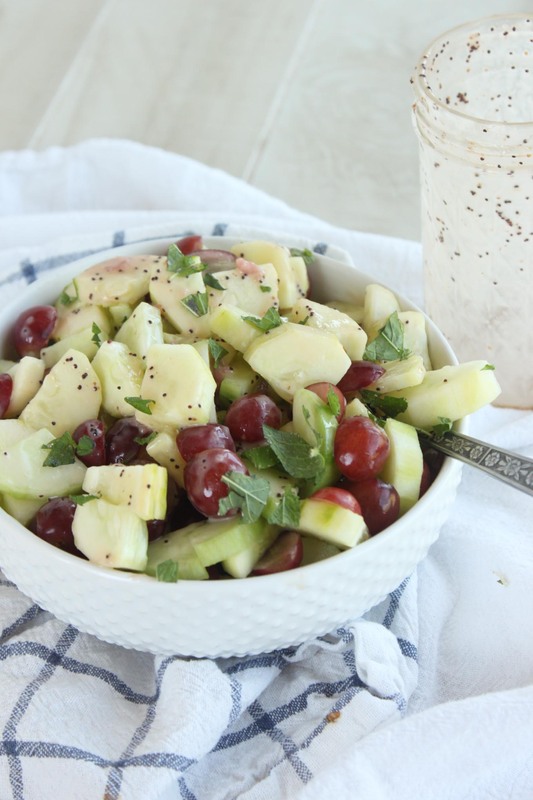 And this ten-minute cucumber and grape salad with poppyseed dressing could be the most fabulous start to a new way of life. Dressing people. Yes, I mean deliciously flavorful dressing. Dressing you don’t need to dip your fork in. NO! Just pour it on and then pour a little more on and eat it. 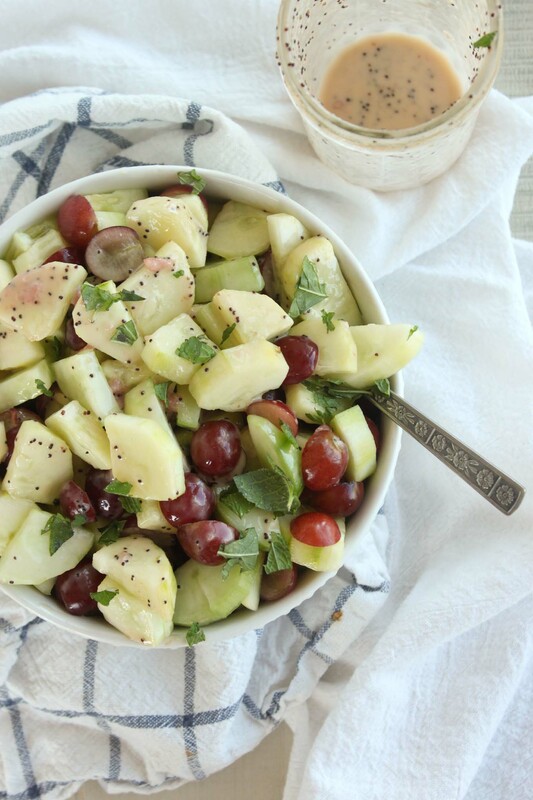 Even if you realized that very step of pouring your dressing over your food was so satisfying that your cucumbers and grapes are swimming in it. Don’t panic, just enjoy every.single.bite. 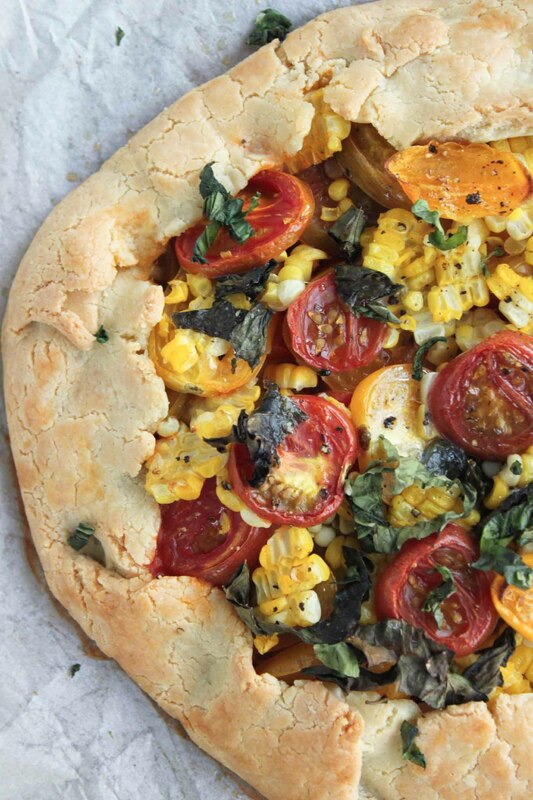 Isn’t food such a beautiful part of life? Peel, slice and halve the cucumbers. Place in a large bowl. 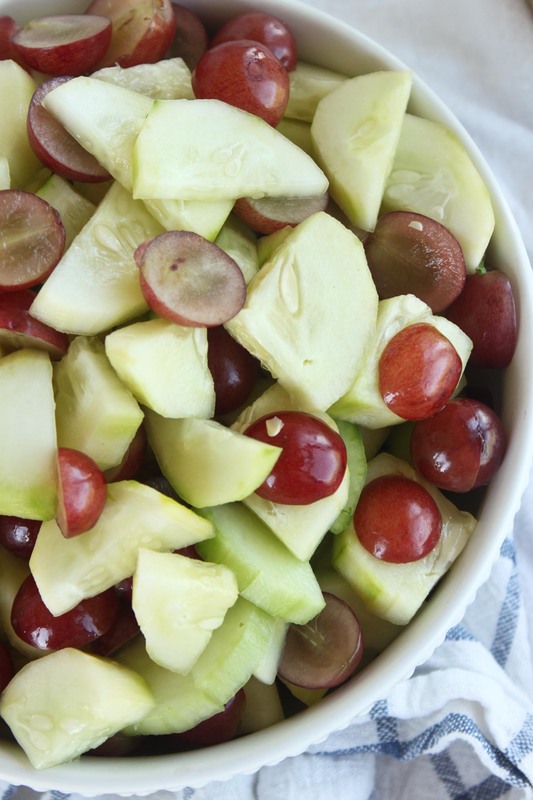 Add to that halved grapes and mix. In a blender add strawberries, garlic cloves, honey, vinegar, olive oil, poppy seeds, salt and pepper. Puree slowly until smooth and incorporated. 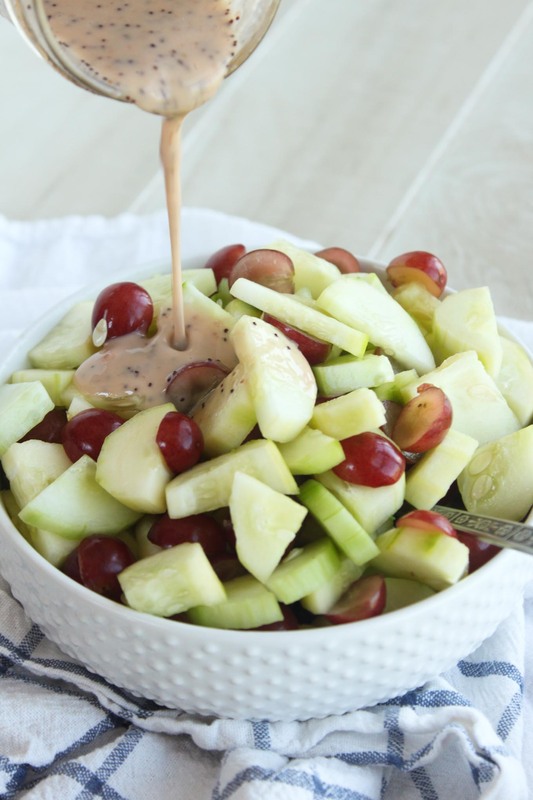 Pour dressings over cucumbers and grapes. Mix and serve! **For better storage pour dressing on right before serving.